The Z-1 was one of the largest, most powerful ship to enter Romulan Naval service in 2283, and the Navy’s first battleship to be commissioned in nearly 30 years. When first encountered. this vessel was reported to incorporate all of the most-modern technology available to the Star Empire, making it a formidable foe. Commissioned into the home fleet in late 2283, early reports showed that the ship was rarely, if ever, sent into the front lines. The Z-1 Type-1 mount ten of the most powerful disruptors available and six photon torpedo bays, which were capable of laying down a withering barrage in all directions. When finally brought to the border areas, the Z-1 change the balance of power. Early reported production quotas of four per year soon gave Klingon pause during their never ending conflict. Production of the Type-1 was sparse compared to other major powers. A total of 18 Type-1’s saw service before being converted to Type-2’s. There are no records of any Z-1 Type-1 being lost or destroyed. 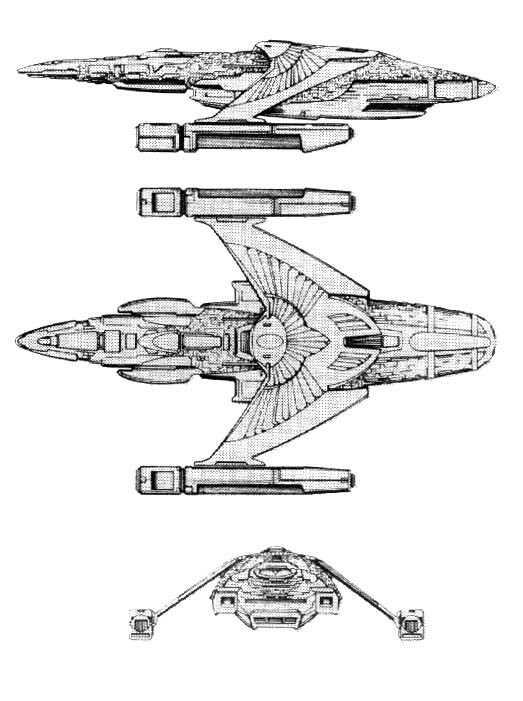 The Type-2 was believed to have been planned in response to better intelligence concerning the Federation’s Excelsior class. With additional disruptor and torpedo mounts, the Type-2 also increased the ships armor. However, the Z-1’s shields were still less efficient than those of the Federation, and many knew that the Z-1 would be at a slight disadvantage. The Type-2 was not produced in great numbers, although most Type-1’s were eventually converted to the Type-2. A total of 13 Type-2’s were constructed. A total of 31 were listed as in-service. 1 Type-2, believed to be a refit Type-1 was destroyed after a lengthy and pitched battle with the Klingons. Reports showed that the Romulan Battleship destroyed 6 enemy cruisers before finally being destroyed herself. A total of 30 Type-2’s were converted to Type-3’s. Introduced in 2295, the Type-3 increased the main computer system as well as the main drive. The main disruptors were upgraded to the RB-12 system which compensated for beam drift at longer ranges. An increase in shield power also complimented the Type-3’s capabilities. They Type-3 would be one of the first vessels to participate in direct combat with the Federation and the last version to be directly scanned before the Dominion war some 70 years later. The Type-3 was one of the most widely produced versions of the Z-1 in anticipation of an open conflict with the Federation. While several did see service again the Gorn, most saw combat against Federation forces in the early 2300’s. Nearly a dozen saw combat with Klingon forces, despite a diminished level of open hostility during that period. 71 new hulls were built, with a total of 101 Z-1 Type-3’s being fielded. 6 are listed as destroyed (4 by the Federation, 1 by the Klingon and 1 by Gorn forces), 4 have been scrapped (all after combat with Federation forces) and 1 is listed as Captured by Klingon forces. 10 were placed in reserve fleets. The Type-4 would again see an increase in the main computer, photon torpedoes and shielding system. This gave the Romulans an advantage over the Klingons that they soon pushed. However, production of the Type-4 was limited in lieu of more versatile platforms. The Z-1 had diminished exploration abilities and was considered too mission specific for successful exploitation operations. Non the less – the tactical capabilities of the Z-1 pushed Klingon forces back from Romulan boarders for numerous years. The Type-5 saw the first real increase in the Z-1’s overall power reserves with the introduction of the RIH-2 impulse drive. Armor plating around the forward torpedo was also increased with the Type-5 becoming the standard version for the next 20 years. Only 11 new Z-1 Type-5’s were built; however, 110 Type-4’s were converted. 1 Type-5 was destroyed by Klingon forces. The Type-6 was the first Z-1 to see significant retro-fitting with newer technology. The main power plant of the Type-6 became the RWK-3. The RWK-3 was not as maneuverable as the RWG-2 system, but was significantly more powerful, giving the Type-6 a significant advantage in combat. The Type-6 also saw a refit of the main torpedo system. However, the Type-6 was never manufactured as a new-build vessel. With newer classes of vessels already equal to the Z-1, and plans for the massive Warbird class well under way – the Type-6 was fielded as a refit only. A total of 63 Type-5’s were refit to Type-6 configuration. 2 Type-5’s were destroyed and 1 was scrapped. 60 Were converted to Type-8’s. They Type-7 was fielded only 2 years after the Type-6. It saw the increase in the main impulse drive and an improvement to the primary shielding system. A total of 51 Type-7’s were fielded with 1 Type-7 being destroyed and 5 older refits being placed in reserve fleets. The Type-8 Z-1 saw a major shift in the internal components of the aging battleship. As plans were drawn up to once-again engage with the Federation, designers realized that to field an improved Z-1, significant internal changes were necessary. Even as the Type-7 was nearing completion of it’s refits, designers put fourth the Type-8 with a completely redesigned internal layout. The Type-8 saw an increase in the overall mass of the Z-1 and heralded the first update to the vessels main disruptors in 60 years. The use of the well established RB-15s nearly doubled the overall firepower of the Type-8. An increased shield system and significant hull plating rounded the Type-8 into a major combat platform. The Type-8 was scheduled to be the last version of the aged Z-1 to be fielded. The new A and B type Warbirds soon eclipsed the Z-1 in both capability, firepower and utility. Despite it’s Battleship designation, the Z-1 was equal to most heavy cruiser in the Federation and Klingon navies. Many felt that the material resources needed to continue fielding the Z-1 at this capability level would be better utilized in constructing new V-70’s or even other cruiser designs. However, plans to mothball the Z-1 fleet were placed on hold in 2370 when disturbing news of the Dominion and a possible threat from the Delta quadrant became front-and-center news. Even as the Senate attempted to manipulate the Federation and Klingons to ensure that the Dominion would be too weak to pose a threat, military leaders began refitting older vessels for what could possible be a protracted conflict. The decision was made in 2371 to upgrade the main Z-1 weapons to the powerful RB-35. Thanks to intelligence reports, the Empire was well aware of the capabilities of the Dominion fleet. The heavy firepower of the RB-35 would allow the Z-1 to utilize a “point-defense” strategy against the more maneuverable Jem’Hadar fighters. Once the Empire joined the war effort, the Z-1 became a major player in the conflict. Often facing 3 to 1 odds, the Z-1 proved it’s self time and again in conjunction with other medium and light Romulan combat craft. Despite it’s heavy firepower, of the 101 Z-1 Type-9’s fielded during the war, 11 were destroyed and 9 were scrapped. At wars end, the empire initiated plans to retire the Z-1 as the new built Valdor class became available. Currently, 51 Z-1 are still in service but are expected to be retired within the next 10 years. The class is named from the RomuIan morlasasi stelam (exploding star). Power Units Available – 24 ea. 24 ea. 38 ea. 38 ea. 38 ea. 50 ea. 50 ea. 50 ea. 50 ea.